I like to design burrs which are difficult to take apart. 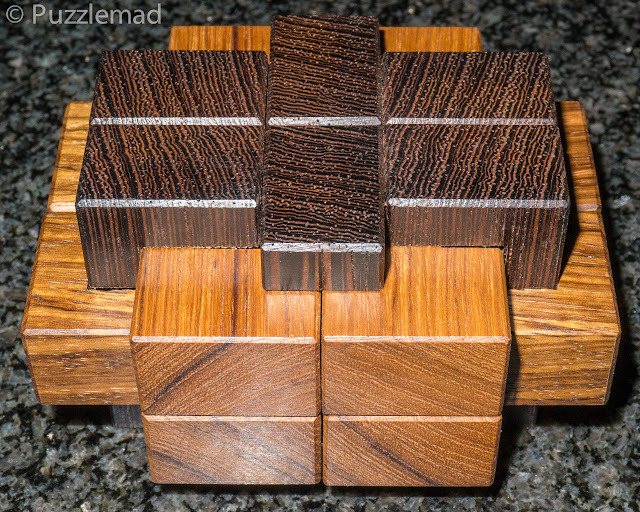 This requires irregular notches in the pieces, and I usually like to hide these in the interior of the puzzle. With the Visible Burr, I decided to make all of the notches visible to the solver. Solution of this puzzle can thus be done by analyzing the notches, rather then by using trial-and-error. Despite waiting for several years for Bill to produce more, it just didn't seem to be happening so when Eric decided to make a run of them (he only produced 40), I had to jump at the chance. Plus look at the gorgeous woods he used! It is Canarywood, Purpleheart and Paduak and is a BIG puzzle by Eric's standards coming in at a whopping 4.75" on each side. The price was moderately high but looking at the wood and the workmanship I couldn't complain but I was a bit shocked to find out that Eric was going to ship them in the disassembled state or, if you prefer, would charge an extra $10 to assemble them for you. I looked at the words "difficult to take apart" and thought that there would be absolutely no chance at all that I could assemble it from scratch. I also wanted the experience that Bill had originally intended so I stumped up the extra ten bucks. When I unwrapped it my jaw dropped at the sheer beauty of it! 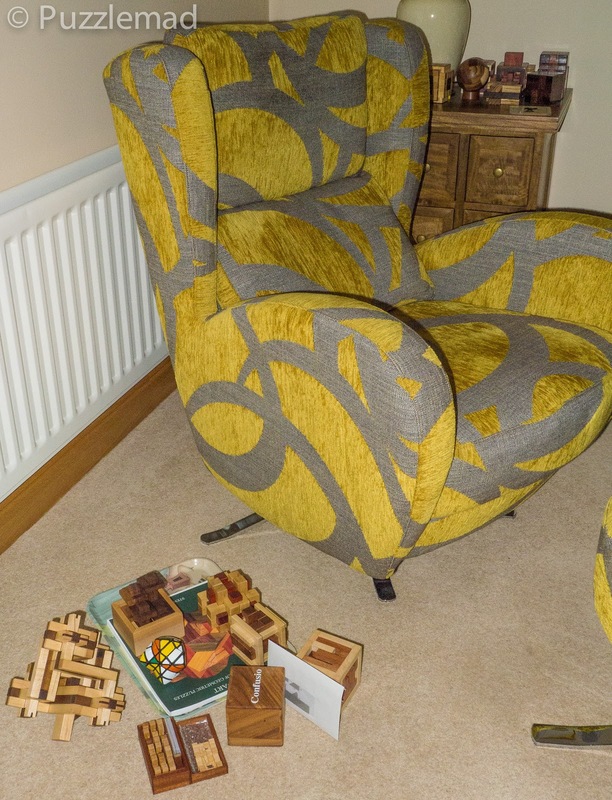 Eric had chosen pieces of wood that were extremely variable in colour giving the puzzle a lovely shading. I was so pleased I paid for the assembled version - there really is no way I could assemble it from scratch without using Burrtools and that would have spoiled my disassembly experience. 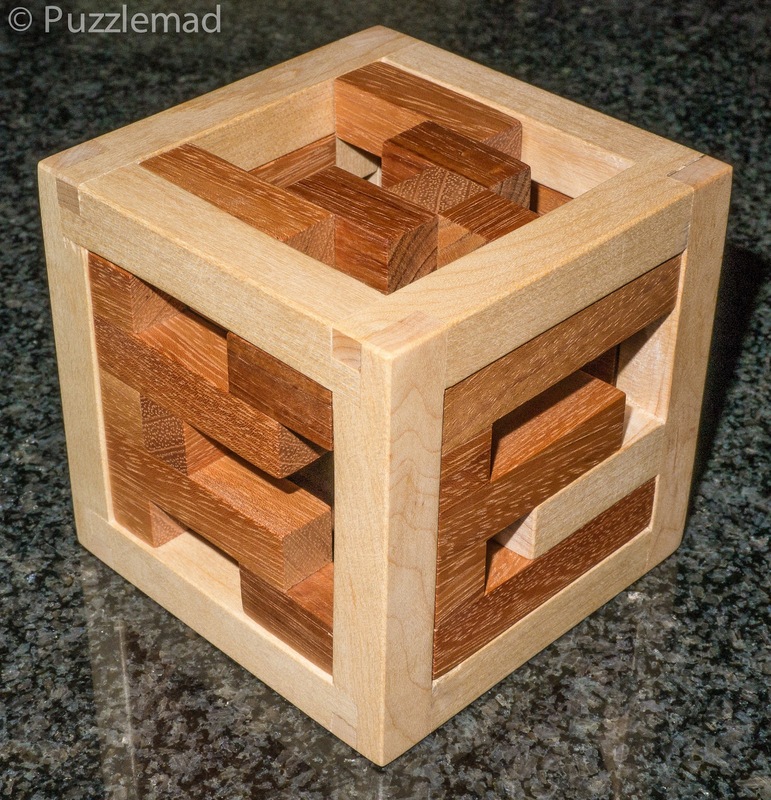 This puzzle then joined the group around my armchair in the living room of "puzzles I'm working on or intend to". My pile of puzzles being played with! "She" is not happy! Whack! Ouch! Mrs S REALLY hates that little area around my chair! I think it offends her that these are puzzles that she hasn't chosen for their beauty and that they are messily strewn all over the floor. I get a complaint about them at least weekly. Whack! Ouch! Sorry dear but you know it's true! Some of the cheaper puzzles or robust metal ones do accompany me to work to be solved and lent to friends and colleagues. But my beautiful wooden burrs cannot be safely transported around - plus an operating theatre is not a friendly environment to anything delicate like puzzles (or flesh)! I was therefore only really able to work on the Visible burr in the evenings at home. On first picking it up, I marvelled at the incredible accuracy of Eric's work - his cuts are perfect to the 1/10,000 of an inch and is why we all keep going back to him for more. I was very pleased to see that only one move seemed to be possible at first and yes I could genuinely see all the notches and hopefully analyse them and solve it logically and quickly. My pleasure quickly became frustration! Let's just say that this is NOT for beginners! Bill's aim of a difficult to take apart burr despite everything being visible was absolutely correct and after that first move quite a lot of further moves became possible. What-is-more, several of the possible moves could be in either direction which opened up other possibilities. I very quickly got lost. My other issue is that I have the memory of a Goldfish and each evening I came home to try again, I couldn't remember what I had done previously. Luckily I did not get lost in a blind end at any point. 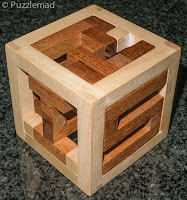 Despite being able to literally see everything, I just could not seem to solve this puzzle - I began to get desperate and after Allard had posted his review, I asked him for the Burrtools file that he had created. I filed it but didn't look at it. I had that file as a sort of "safety net" giving me confidence to carry on. I gradually, over many weeks, got to recognise sequences that I had tried and ended up repeating them many times. Suddenly in the middle of a sequence that I must have done 20 times, I found another move, with an audible "Thwack", a new piece moved. Looking at it I was sure that I had tried to do it before but not managed to move it. Why?? This is where Eric's accuracy has a downside! The humidity in the UK is absolutely perfect for puzzles - all my wooden burrs are usable at all times throughout the year so my sudden ability to move a new piece was not due to humidity and locking up. Eric routinely does not chamfer off the inner edges of his burrs (it saves on cost) and the consequence is that the pieces have to line up, not to the mm but to the 1/10 mm. I probably had the required piece in position a dozen or more times but not perfectly lined it up and it wouldn't go. Almost all the other craftsmen like Brian Young, Brian Menold, Alfons Eyckmans and Stephan Baumegger all chamfer the edges to allow for smoother movements. I find with Eric's puzzles that I sometimes need to use lock-picking techniques to get pieces to move. Luckily even the pieces look gorgeous! Because it has stayed as a pile of beautiful sticks ever since I took it apart. After Jerry's description of how much difficulty he had assembling it with the Burrtools file, I just have left it on my coffee table as a beautiful pile! One day (hopefully soon) I will get around to putting it all back together again. My advice to people who bought it in the disassembled state? Get the burrtools file and put it together. Leave it a week or so for you to forget and then try what Bill originally intended! I think they look lovely just like that! But "She" won't let me! Whack! Ouch! 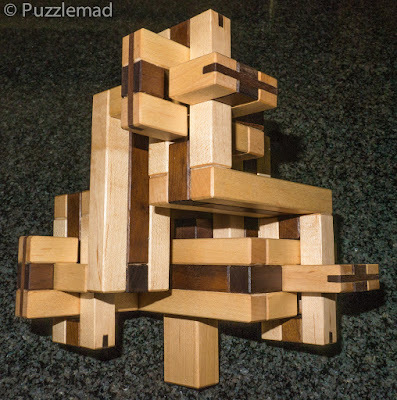 Now there are other puzzles where every gap and every piece shape is entirely visible and yet I still have struggled badly and even totally failed to solve them without assistance! 2 weeks ago I mentioned the incredible Really Bent Board Burr design by Derek Bosch and made for me by Johan Heyns. Really Bent Board Burr - another masterpiece! Hmmm! Imagine them all in the same plane..... Nope!!! I have no idea what that means and still have no idea how to solve it! I made my burrtools file and have disassembled/reassembled it several times but still cannot do so without cheating. I think that I next will try the easier assembly of level 10.6.1.4 and see whether I can disassemble that. After that, this beautiful monster/puzzle will go on display on the sideboard in my Dining room. Whack! Ouch! Ooh! Haven't I asked about that dear? It's too big to live in my study! Isn't it? I got stuck here for a while - it's not much better now! For the life of me, I cannot "see" how to solve it! One day I will have to get Alfons to send me the Burrtools file but I worry that I am off the main pathway and will not be able to solve it even with the help! I'm really not very bright! Let's not forget I have recently received a gift from Brian Menold of another Kevin S burr (designer unknown) in which I should be able to see the notches and position of everything. After 2 weeks of trying I have barely even scratched the surface of it. Everything is visible yet it scares me to death. So visible does NOT equal easy! In fact the only thing I can confidently say is that visible equals gorgeous and equals very clever! I adore these burrs (actually I adore all burrs) but it's not necessary to go for the highest level every time. 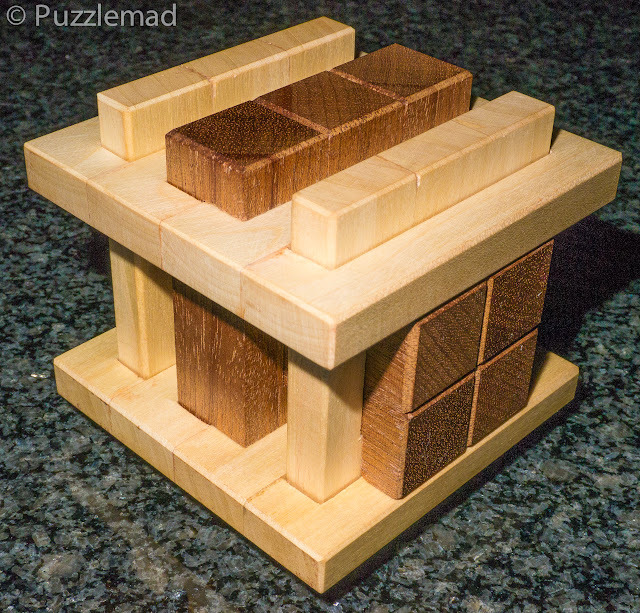 Many other lower level puzzles are just as fascinating and challenging. Recently I have been working through my last batch of puzzles from Stephan Baumegger - I deliberately chose a bunch with lower level than usual and generally interesting shapes (maybe with hidden pieces). All of these had very complex constructions and none allowed you to see the interaction of the pieces inside yet all of them were a tremendous challenge but still solvable (even by a numpty like me). For example Chained pictured above is a fabulous puzzle with lots of hidden interactions and a hidden internal piece. I solved it within a few days and actually found that it got much harder after I removed the first piece! Yes, with one piece removed I could see inside much better and determine how the pieces interacted but most of my struggle with that beautiful puzzle was with that 2nd piece. So when the visibility went up the difficulty did too. 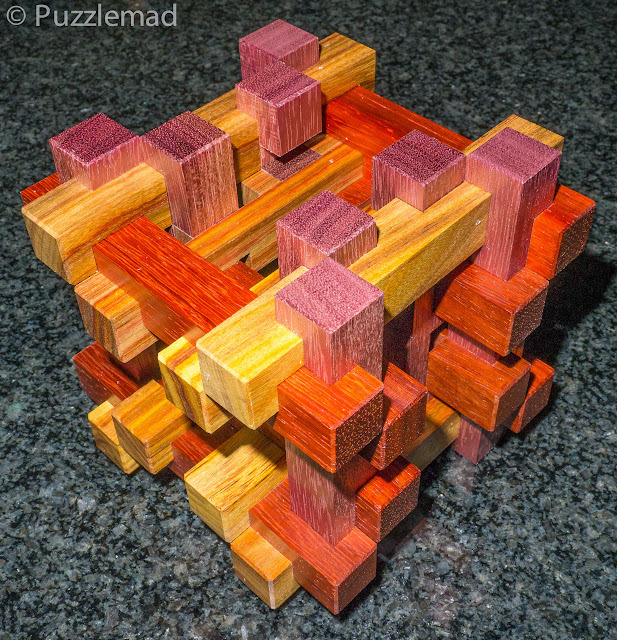 Finally, a puzzle I really loved was a very special 6 piece burr called Wallace (also from Stephan). This is a very special design (he has 3 others, 2 of which have been constructed) which is just 6 pieces but effectively forms a hidden maze. I solved these fairly easily and really enjoyed doing so despite the fact that the pathways are completely hidden and even when you can see the pieces, it doesn't help you determine how the puzzle works. My friend on Facebook, Paul Morrison chose this as his first ever burr and has really struggled with it so maybe I am gradually improving my skills! 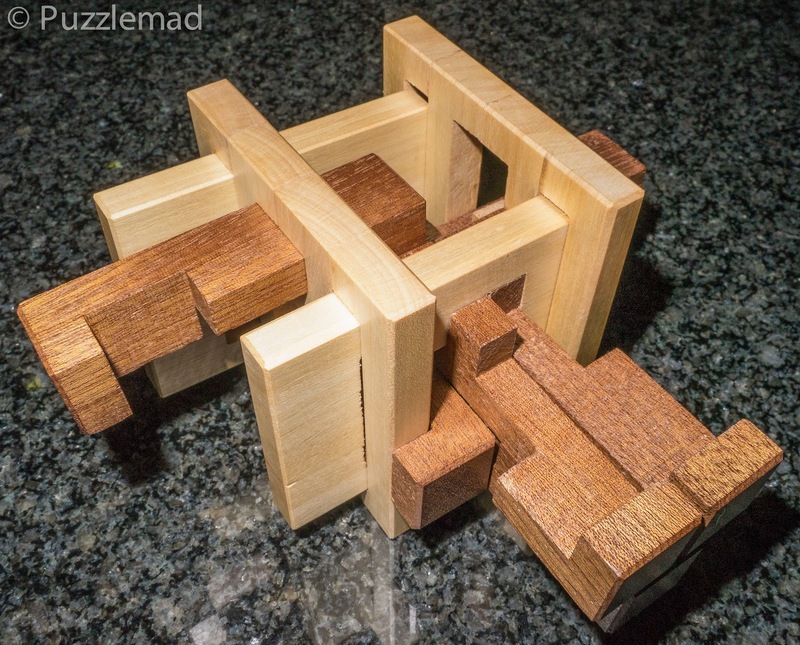 Seeing the maze really doesn't help - imagine assembling this from scratch. Wow! 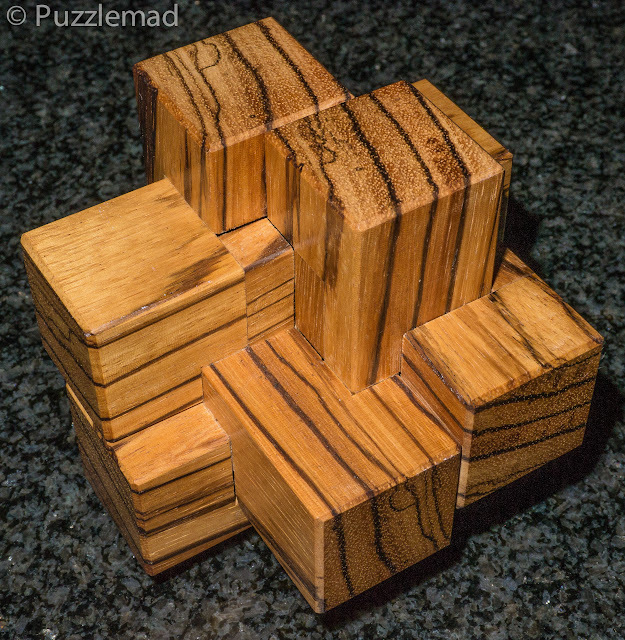 That was quite a long post - all to show that visibility is really NOT the key to an easy burr puzzle as well as to show off some of the gorgeous beauties that I have been playing with recently! I hope you found this useful or at least interesting. I also hope it may entice you to try some of these wonderful burrs. I certainly will keep on buying and maybe my skills will improve sometime. If you are interested, then I have posted a video of the disassembly and reassembly of Wallace on my YouTube channel. Wow! What a great post. The complexity of these burrs and the craftsmanship of design and construction is so impressive. And that's a great chair! 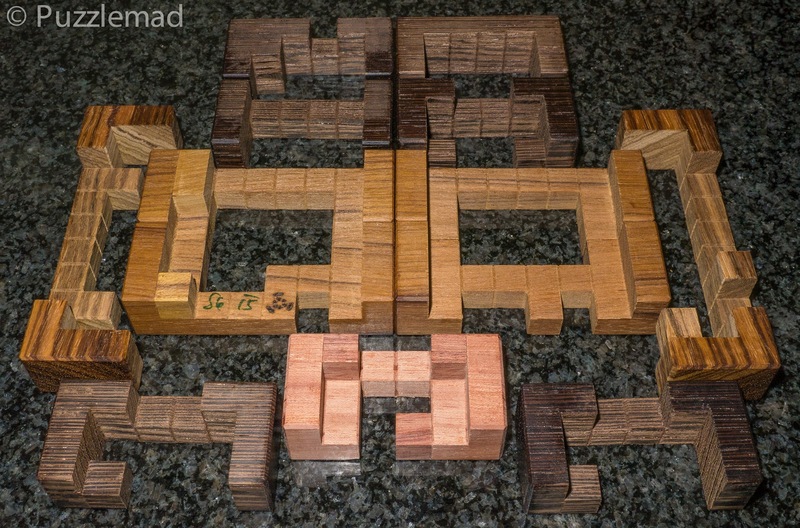 You just need one more little table or shelf to make the floor puzzles look like they belong there. 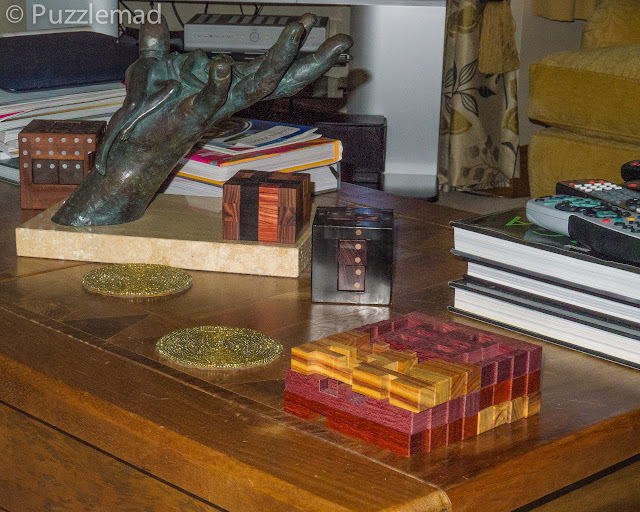 Maybe pile enough puzzles up to look like a table? Thank you! I'm really glad you enjoyed the post! It took many hours to think up and write! I try to make it more than just a puzzle review. 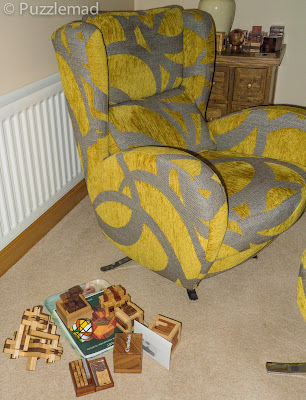 I love that chair too and your idea about the big pile of puzzles is very enticing but the thought of another Whack! Ouch! does make me pause a while!